CAC designs and manufactures a variety of gas detectors and monitors for specialized medical applications such as that required for Magnetic Resonance Imaging (MRI). To date, CAC has produced over 12,000 such monitors for GE Medical alone which are in use world-wide. CAC's OxySense 1000 series of O2 monitors offer an accurate and simple method for determining ambient oxygen concentrations in work environments. Normal ambient air contains typically 21% oxygen. When this oxygen level drops to below 19.5%, a potentially hazardous condition may exist as defined by OSHA publication 29 CFR Parts 1910.146. Such a reduction in the available amount of oxygen may not be immediately apparent. Further, impaired concentration and faulty judgement can further reduce an individual from recognizing a possible reduction in area oxygen. 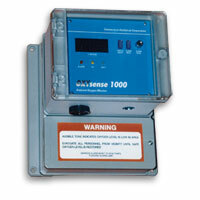 The OxySense monitors provide an invaluable means of continuous ambient oxygen level monitoring capability assuring prompt worker notification of potentially harmful oxygen deficient environments.